The Free Syrian Army vs. the Syrian National Council—Which Should We Support? A year into the Syrian uprising against Bashar Al-Assad, the dysfunctional nature of Syrian opposition politics isn’t exactly news. But the resignation last month of Syrian dissident Kamal Labwani from the Syrian National Council (SNC)—which he accused not only of being “undemocratic” and incompetent, but intent on undermining the secular basis of the revolution—is an especially troubling indictment of the opposition’s hapless government in exile. The Obama administration should heed Labwani’s testimony, and reassess its diplomacy accordingly. Indeed, taking a cue from Labwani’s experience, Washington should refocus its attention away from the SNC, in favor of providing more active support for the less centralized, but potentially more effective Free Syrian Army (FSA). I can personally attest to the depth of Labwani’s commitment to a free Syria. I first met him in 2005, when he was in Washington for meetings with Bush administration officials. During a meeting at the Pentagon that I attended, Labwani, a medical doctor who was a prominent member of the “Damascus Spring” reform movement in 2001, did not ask for U.S. assistance in toppling Syria’s Assad regime. Instead, he spoke eloquently about the need for political reform in his country. When I asked him whether he feared being jailed on his return, he said he knew he would be arrested, but nonetheless believed it was important for U.S. officials to hear this message. As anticipated, Labwani was arrested upon his arrival in Damascus, and subsequently sentenced to twelve years of hard labor. He had spent five years in prison when he was released early last November, eight months after the start of the current uprising against the Assad regime. Soon thereafter, Labwani joined the Turkey-based SNC, which was claiming to represent the Syrian opposition on the international stage. He quickly assessed, however, that his hopes for a democratic, pluralistic, and secular Syria would not be advanced through the organization. Fundamentally, Labwani wrote in his draft transition plan, the SNC was not created as “an operational body to win the revolution.” This lack of mission led to ethnic, religious and ideological divisions exploited by the regime. The SNC was rife with “political competition” when what was required was to “push single-mindedly to secure victory against the dictator.” Labwani was willing to serve time for trying to promote democratic change in Syria, yet he couldn’t abide the ineffectiveness of the SNC. He hasn’t been alone in his frustration. International observers have found the SNC to be fractious, replete with infighting, lacking in credibility, and increasingly Islamist. In February, Secretary of State Hillary Clinton herself lamented the lack of a “viable” opposition. While the SNC appears hapless, lately the FSA, which has little interest in being answerable to the SNC, has been taking positive steps to try and establish a more unified command. The FSA has largely been a franchise operation of around fifty battalions fighting the regime absent any centralized control, but in early March two rival officers vying for leadership of the FSA reconciled and issued a joint statement on YouTube directing troops to follow the orders of just one commander, Colonel Riad al-Assad. Even the SNC has started to come around to supporting the FSA, going so far as to establish a military council to support the force. Such inaction has consequences. In recent weeks, the FSA has suffered a series of tactical setbacks, raising the specter of a lengthy war of attrition and prolonged survival of the regime. The Assad regime is continuing to receive Russian arms shipments, while the opposition is running low on ammunition. As much as the Obama administration and the United Nations would like to pursue a “non-violent” diplomatic and humanitarian strategy, notwithstanding U.N. envoy Kofi Annan’s effort to promote a ceasefire, the process of transition in Syria—after one year of crisis that has resulted in nearly 10,000 dead—is unlikely to become “peaceful” anytime soon. It would be so much easier for Washington if the Syrian opposition was disciplined and united like the Libyan Transitional National Council was, at least before they took power. 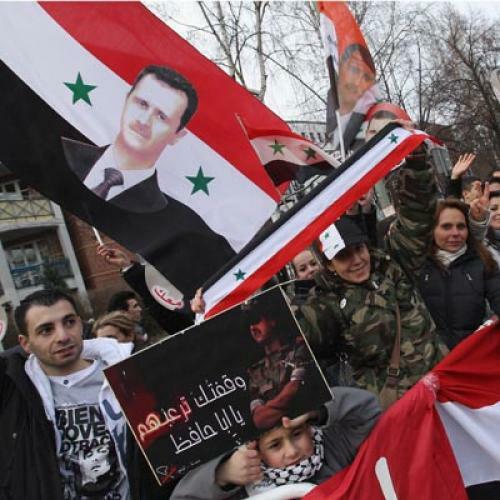 Alas, a truly cohesive Syrian political and military opposition is not on the horizon. Instead of spending months trying to integrate these disparate groups, Washington would be better advised to lower the bar and err on the side of action. As it is, when it comes to the Free Syrian Army, the administration is letting the perfect be the enemy of the good. The FSA is not perfect—it may not even be good. But the alternative—a diminished and increasingly Islamist opposition facing a resurgent Assad regime—is much worse. David Schenker is the Aufzien fellow and director of the Program on Arab Politics at the Washington Institute for Near East Policy.